Our first stop, and probably our favorite city, was Barcelona. We began our visit with a quick bite at Restaurante Neyras where we snacked on pa amb tomaquet, a staple of Catalan dining. Pa amb tomaquet is crusty bread topped with a mix of crushed tomatoes and olive oil and, as simple as it sounds, it is quite tasty. Our exploration of the city started with a stroll down La Rambla, the main tourist street that runs perpendicular to the water. Right off La Rambla is the La Boqueria, an amazing public market. Inside the market are stands selling everything from nuts and candies to fresh fruit and recently caught seafood. 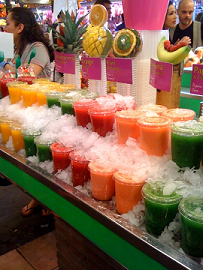 Nick and I sampled the brightly-colored fresh fruit juices that are available throughout the market for as little as 1 euro. Nick tried the pineapple-lime and I went with pineapple-raspberry. 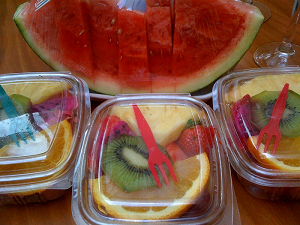 Delicious and refreshing. 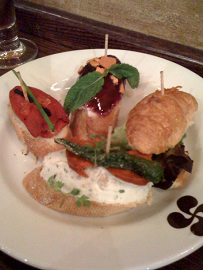 Most people associate Spain with tapas, but Nick and I found something that we like even better than tapas: pintxos. Pintxos are essentially slices of crusty bread topped with, well, anything. 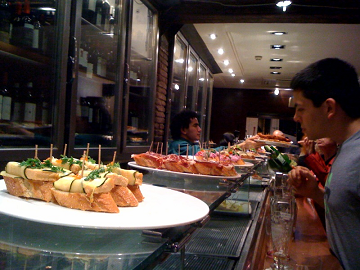 We discovered pintxos at Irati Taverna Basca, which sells pintxos for only 1.80 euro each (a great price, believe me.) 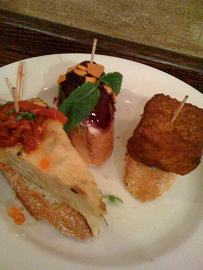 Some of our favorite pintxos at Irati were the stuffed pepper, the fried mashed potato and jamon square, and the quiche. At Irati, and at most pintxos and tapas places in Barcelona, you are given a plate and then can browse the restaurant's selection, choosing whatever looks good. At the end of your meal, you hand the plate to whoever is behind the counter and your leftover toothpicks are counted up to see how much you owe. Easy system once you figure out how it works. If our dinner at Irati was our favorite meal in Barcelona, a close second was our lunch at Elisabets. Elisabets is a small restaurant located a few blocks off La Rambla that serves Catalan comfort food. A three course lunch goes for only 10.25 euros, wine or beer included. The menu is only in Spanish, but luckily our waitress took pity on us and translated. 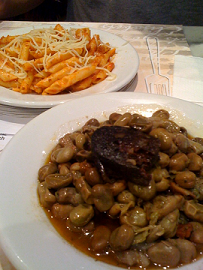 For our first course, Nick ordered penne bolognese and I got the Catalan green beans. Some fellow tourists at a table near us seemed to have some sort of problem with my green beans, and kept unsubtly trying to get a better look at them. In all fairness, they did look pretty gross...but they tasted amazing. Their loss. 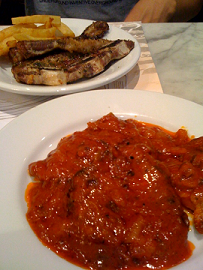 For our main course, Nick had grilled steak with french fries and I had pork in tomato sauce. I took a leap of faith ordering pork as I don't usually like a plate with only meat, but the pork was tender and very tasty. Nick loved his steak too. Our desserts where decidedly underwhelming, but that was fine with me because the first two courses where so great. So as you can see, we ate well in Barcelona. But I do have to admit, we did not find Irati and Elisabets on our own. Our two most delectable meals in Barcelona were all thanks to Rick Steves and his Snapshot Barcelona guidebook (and to my mom for sending it to me). Rick gave excellent suggestions as well as good directions for getting to each place and we wished we had his advice for all the other cities that we went to. I highly suggest his books for anyone traveling to Europe!